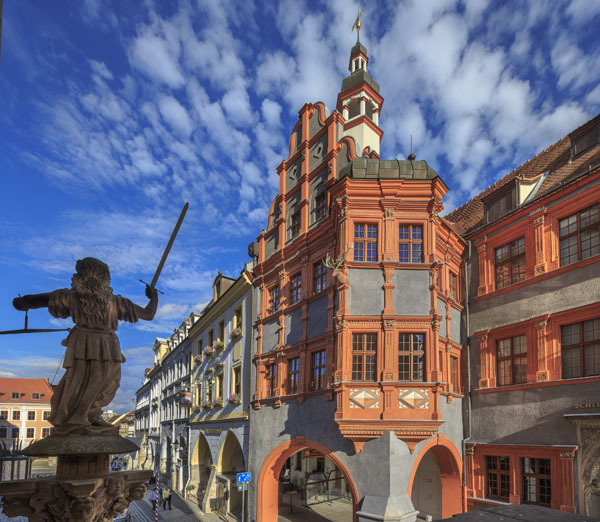 Those who visit Görlitz for the first time are immediately impressed above all by the architectural diversity of this historic city, which is among the best preserved in the whole of central Europe. Görlitz is regarded as the largest single site of architectural significance in Germany. Its 4,000 land-marked buildings, most of which have been lovingly restored, are witness to the great riches of the past. The inns of bygone days are today inspiring locations where guests can experience a unique feeling of well-being. Visitors coming here for the first time are overwhelmed especially by the architectural variety: 4,000 elaborately restored architectural monuments from the periods of Gothic, Renaissance, Baroque, Art Nouveau and Wilhelminian architecture; splendid testimonies representing more than 500 years of European building history – there are lots of superlatives to describe the beauty of the city on the Neisse River. Be it the splendour of the medieval houses of the cloth makers around the historical Lower Market (Untermarkt), or the Baroque buildings on Upper Market (Obermarkt), or a completely maintained residential area from the Wilhelminian period: The rich history of the city in the German – Czech – Polish border triangle is everywhere. Not only visitors, but also national and international film producers feel inspired by the impressive cityscape of Görlitz; apart from the dreamlike setting, they especially appreciate the hospitality of the locals. Whether you enjoy the cosy restaurants and cafés in medieval buildings or the numerous cultural events representing the special flair of the German-Polish European City, or a shopping tour, or simply relaxing at the banks of the beautiful lake just outside the city gates - Görlitz has a lot to offer. Located in the border triangle, Görlitz is a perfect starting point for short trips to Upper Lusatia, to Poland or the Czech Republic, for example to Fürst-Pückler-Park, a UNESCO World Heritage site, to Breslau/Wroclaw or to Prague. Being a European City for 20 years! There are not many cities in Europe symbolising European history the way the two cities of Görlitz and Zgorzelec do: there was separation after the Second World War followed by timid approach, there were closed borders and, after the political changes in Eastern Germany in 1989, an intensive common development. 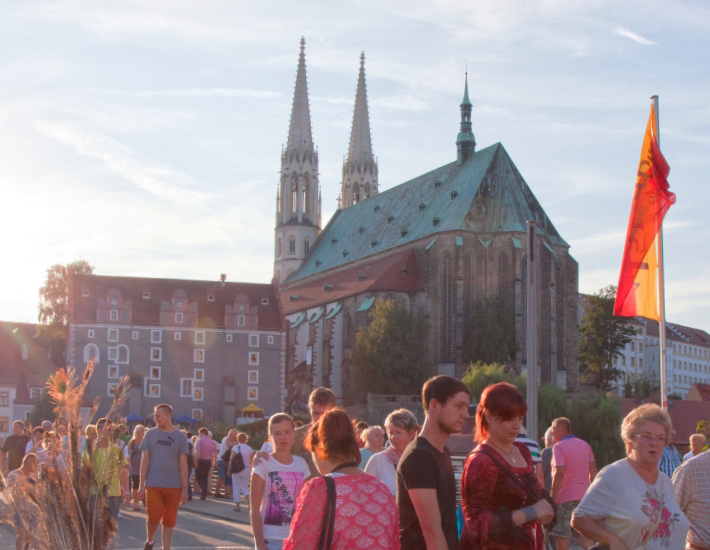 In 1998, Görlitz - together with Zgorzelec, the Polish part located on the Eastern side of the Neisse River – proclaimed itself a European City, and it shows in reality how people from two different nations are able to overcome borders. Since the extension of the European Union in 2004, the city has literally moved to the centre of our continent. Ever since then, the city‘s further exciting development in the middle of Europe is based on international interaction. Please see the webspecial featuring the European City and its history and stories. Görlitz keeps attracting its visitors with a lot of charm and a romantic atmosphere. Numerous film producers rave about the versatile film set of the city on the Neisse River. 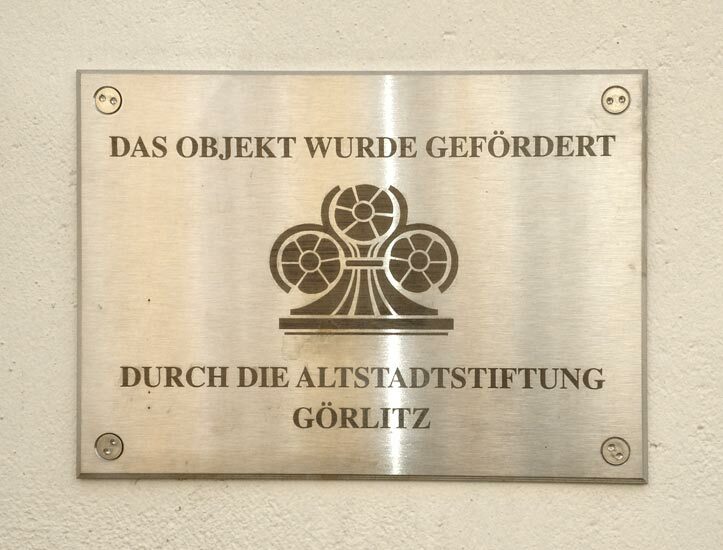 It was in the 1950-ies, that Görlitz was chosen a film location for the first time, and since then, more that 100 films have been produced here, among them „The Reader“, “Inglourious Basterds“, “Goethe!“, “The Book Thief“ and the star-studded “Grand Budapest Hotel“. 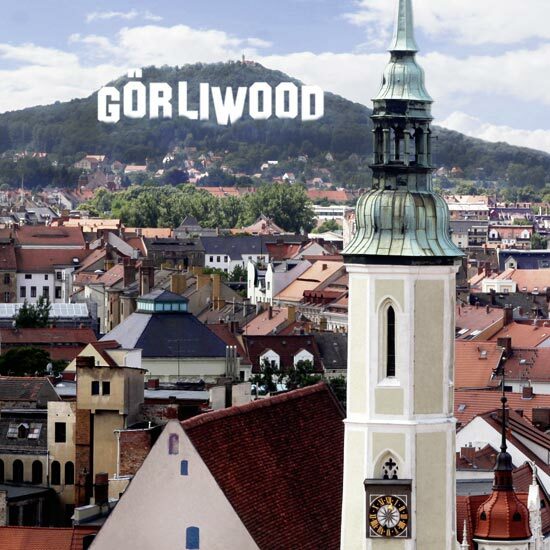 The locals, however, turned out to be so wonderfully unexcited, and thus, earned another plus in the eyes of Kate Winslet, Emma Thompson, Wes Andersen and other celebrities from the film scene: “Görliwood“, as the city is fondly called, is a place where even stars can move around easily and undisturbed. Last, but not least, the film productions are an important aspect regarding local economy, too, and make hotels, restaurants, workers and service companies benefit from the film crews being in town. Chosen to be the location for “The Grand Budapest Hotel“, Görlitz was even awarded the title of THE European film location of the decade. Today’s splendid cityscape is mainly a result of careful restoration as well as private and social initiative and engagement, but to a great extent, it is also thanks to an unknown donor. As of the year 1995, this benefactor has annually been donating one million German marks, later 511.500 Euros, to the city. The money was supposed to be spent on the restoration of listed architectural monuments. The Old Town Foundation established for this purpose was able to support the restoration of altogether 1572 private, municipal and sacred buildings. In spring 2016, the city gratefully received the final amount of 340.000 Euros. The donor has wished and still wishes to remain anonymous. To those, who nevertheless were curious enough to ask for further details, the law office in charge of the annual bank transfers replied that the source of money would dry up immediately, in case the mysterious donor’s name should be revealed. The city on her part respects this wish, and it expresses its thankfulness to the noble donor in its own way: Buildings restored with his or her help are marked with an appropriate tablet of stainless steel. Ask the time in Görlitz, and you will get the most accurate answer. Due to the city’s geographic location right on the 15th meridian, the time corresponds exactly to Central European Time. 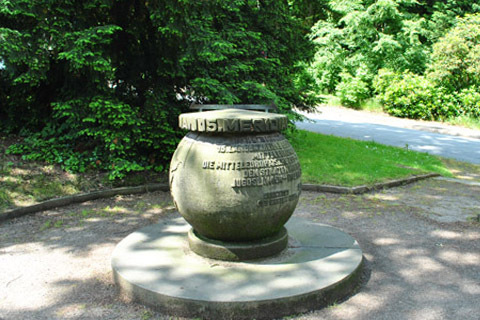 The Meridian Stone, a stone globe near the city‘s Event Hall, refers to the city’ special position.